I recently discovered something so utterly simple yet just a little bit genius. I had to share it. The subject is eggplant. As a kid, I was not a fan of eggplant. I always thought cooked eggplant was rather slimy and just generally questionable. It's always been one of my mother's favorite vegetables and growing up, it would show up on our dinner table stuffed with fish paste and pan-fried (like this); she would order the same thing at dim sum restaurants. I always passed on it and went for the straight-up filling instead that she would likewise pan-fry. Now, you know how the story goes. I grew up, I got more open-minded and I now enjoy eggplant almost as much as my mother (okay, maybe not quite). But the one thing I still dislike about eggplant is how much oil it absorbs. I figured roasting was the best answer and in a quest to eat more eggplant, I stumbled upon a recipe from this America's Test Kitchen magazine for "soba noodles with roasted eggplant". It was the way the eggplant was roasted in this recipe that intrigued me. 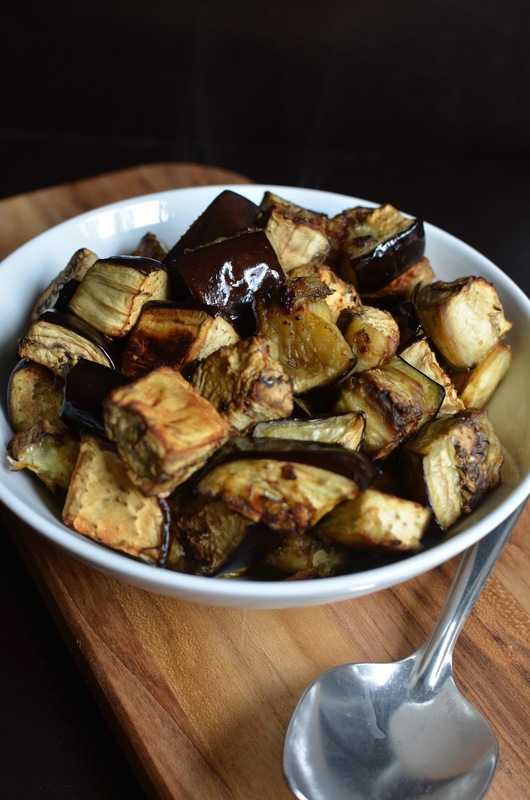 It's quite simple: you roast cubed eggplant with some oil and instead sprinkling some salt over them as you would naturally think to do, use soy sauce instead! And here's what happens - the eggplant soaks up that soy sauce, which gives it such a great boost of flavor (you can really taste it). The meatiness of the eggplant works so well with the almost-beefy flavor of the soy sauce itself. It makes me think I really don't need meat in my life. It is totally delicious! I've made a few batches already in the last few weeks and my husband and I are loving it. It's so good as a side dish; we have it alongside stir-fries and noodles or rice, and it'd clearly be good with soba as the original recipe outlined. This is so simple but such a neat little trick for anyone who likes eggplant and is looking for an easy way to prepare it. It doesn't surprise me that the folks at America's Test Kitchen have everything figured out and calibrated. When you roast the eggplant, keep the specified recipe amounts in mind. It calls for 2 tablespoons vegetable oil and 1 1/2 teaspoons of soy sauce (I use regular, not low-sodium) for 1 pound of eggplant. If you are too heavy-handed with the soy sauce, it could be too salty and if you don't use enough, you'll wish you did (I have learned from experience). I've roasted 3 batches of these eggplants so far. In my last batch, I substituted some of the vegetable oil with sesame oil. I used only about half a teaspoon and it didn't make a discernible impact on the final taste but I liked giving that a try and mixing things up a tad. It's amazing how the eggplant instantaneously soaks up the oil and soy sauce like sponges. It makes me glad to be roasting it because if I was cooking these on the stovetop, I can see myself continuously adding more oil. After about half an hour in a 450 degree oven, you get some flavorful morsels of eggplant. It's got such a hearty, meaty, rich flavor. This is a great make-ahead to keep in the refrigerator if you can keep yourself from eating it all in one sitting. On the subject of roasting vegetables...Now that it's getting chilly, it's no hassle to turn on the oven and get roasting. Regardless of the weather, I roast sweet potatoes all year round because I'm addicted to them. In an effort to branch out a bit, I happily hopped on the spaghetti squash bandwagon last year and, recently, I tried Delicata and Kabocha squash! Maybe it was luck but my first batch of delicata squash was so, so sweet. I'm a fan. And I have Nami @ Just One Cookbook to thank for teaching me about Kabocha squash. I was excited to learn about this because I've enjoyed it in tempura form at Japanese restaurants but have never been able to put a name to it . Every time I'd ask if it was pumpkin that I was eating, I'd get a smile and a nod but no specifics. The funny thing is I made a mistake and mistook an acorn squash for kabocha at first! I roasted it and was disappointed in the bland flavor, wondering if I'd just gotten a "bad" kabocha. On closer look, I came to realize my mixup and when I finally roasted this Asian variety of winter squash, it was a happy discovery because it has a unique texture and flavor that I really like. It really is a bit like roasted chestnuts - and chestnuts are one of my favorite things on earth! The kabocha squash has a fluffy interior yet a density to it that makes it really filling and satisfying. So now that I've discovered it, you can bet that I'll be mixing things up with some kabocha squash whenever I'm not eating my sweet potatoes and chestnuts. It is truly mind-boggling how many things there are to discover and eat out there! Preheat oven to 450 degrees and position an oven rack in the middle position. Line a baking sheet with foil and brush it with 1 1/2 teaspoons of vegetable oil. In a large bowl, whisk together the remaining 1 1/2 tablespoons oil and the soy sauce. Add eggplant and toss together to combine. Spread onto prepared sheet in one even layer. Roast until eggplant is browned and tender, about 25-30 minutes, stirring halfway through roasting. It is a great little idea. I never thought I'd crave eggplant but it's happening these days. That's a great idea, Monica. It's the perfect time of year for roasting vegetables. Of course, America's Test Kitchen would have come up with this genius method! Must try with my next eggplant! Okay this is kinda genius! Eggplant does absorb so much oil ... yet I would have never thought to use the soy sauce instead of salt! This will most definitely be tried out next time I make eggplant! I am so glad you agree with me, Ashley. It's definitely one of those 'why didn't I think of that!' moments. Hi Monica, such a clever way to prepare eggplant, will give it a try. Do give it a try. I really enjoy that bit of soy flavor in them. Haha my mom is the same way - she LOVED eggplant and I disliked it as a child too :) Of course, mom's area always right and it's one of my favorite veggies now too. I love roasting eggplant but have never tried it with soy sauce. Usually just olive oil and salt so I can't wait to try this. Such a great and tasty idea! Oh so glad to hear that you love kabocha squash too. I've been trying to find some after seeing it on Nami's site too since I love all squash so I would love to try it. Hopefully I will have luck soon :) Thanks for sharing Monica! haha - glad you could relate, Kelly! : ) And oh, I ate about 12 oz. of kabocha squash with my lunch today. I was eating them like French fries. They're not as sweet as some chestnuts or Japanese sweet potatoes but it's really fluffy and you can still taste squash but it's also very much like potato/chestnuts. You have to try it. Good luck finding it. I'm going to make sure I buy more soon since I'm not sure when the season ends. I love the idea, Monica. Must give it a try soon. I've only had eggplant a few times in my life, and every time, I've enjoyed it. I've never made it myself though, and this sounds like a great flavor profile. Pinned! Thanks, Kristi. This is so easy and I always considered eggplant a very difficult thing to cook. I cannot thank you enough for this recipe Monica. I can see so many uses for this simple dish! Thank you a hundred times! Loved your post - the story about your mom loving eggplant and about the squash especially! I have never loved acorn squash and am on a quest to find kabocha now! You rock! I hope you find the kabocha...it is so unique...it's squash, it's potato, it's chestnut, it's the fluffy kind of sweet potato. It's dense and really filling. I was chomping on some today like French fries! I cook eggplant with minimum spices and this is just great recipe. Soy sauce? Wow, just soy sauce.I must have to try this. Yes, the little bit of soy sauce goes a long way and gives it a good flavor...makes the eggplant even more 'meaty'. I love roasted eggplant...but never tried with soy sauce...I love the simplicity of this dish! It's simple dishes that get me cooking and are things I'll make on repeat. Thanks, Juliana. You are so right about the eggplant soaking up all the oil. We eat a lot of eggplant and I've tried roasting it too but I prefer the fried ones probably because that's how I've eaten it since I was a child. But now I will try it with soya sauce..I have a feeling it'll be different.and delicious. Thanks for sharing this lovely recipe. I hear you! It's good to try things in different ways to really know how you prefer it. This simple roast with the soy sauce gave it good flavor and we like it a lot. That said, I'm pretty sure I'd be a fan of your fried ones! Yum! I'm always so bad at cooking eggplant without HEAPS of oil, so this is an amazing alternative! I've rarely cooked eggplant at all but now it'll become much more of a regular thing for me since it's so easy and tasty. It's a good alternative. You might not want to use it on pasta with red sauce but it's a great side with stir-fries or meat, etc. Thanks for stopping by! I'm a huge fan of eggplant so this one will definitely come in handy! Thanks! So happy to read your post about kabocha vs acorn squash. Some acorn squash has similar color as kabocha, so I think it's easy to make a mistake. ;) I love eggplants, but I had never roast it at home (I like it in my sandwich when I buy sandwich outside). This is my next eggplant dish! I always love the flavor and texture of eggplant, but the rest of my family is not into it... Thanks for this roasted eggplant recipe! SUPER easy! Lovely recipe! I love eggplant and am always looking for new ways of cooking it. This is perfect! I've been picking up eggplant from the farmer's market and roasting like this and really enjoying it. Hope you try it one day!